Perhaps it can be said that the Tedins, Hans and Olof, were responsible for introducing pea genetics to Scandinavia. 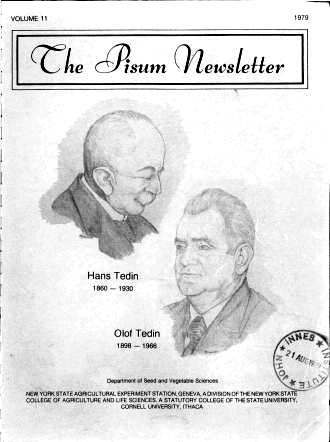 The papers by Hans Tedin in Hereditas 1920-1928, and the one by Hans and Olof Tedin and Wellensiek, 1925, can be counted among the classic genetical papers on Pisum. Hans Tedin (1860-1930) was employed as plant breeder at the Swedish Seed Association, Svalof, from 1891 nearly until his death in 1930. He showed already in the 1890's that old landraces of self-fertilizing plants could be split up into a multitude of constant strains. This is said to be an important foundation for Johannsen's later work resulting in the pure line concept. After the rediscovery of Mendel, he started systematic genetic studies with Pisum. Olof Tedin (1898-1966), the son of Hans, also spent most of his professional career as a plant breeder with the Swedish Seed Association. He is famous in Sweden for his book (co-authored with Bonnier), "Biologisk variationsanalys" (Biological Analysis of Variance), a book which is noted for its clarity, simplicity, and logic. A GENE FOR STEM BIFURCATION WITH FULL PENETRANCE. EXPRESSION OF THE dgl MUTANT. A PEA MUTANT HIGHLY SUSCEPTIBLE TO THE FUNGICIDE "Maneb"
YIELD POTENTIAL OF SEMI-DWARF AND DWARF GENOTYPES. SIMPLE PROTEIN ASSAY FOR PEA. PRESENCE OF THE HIGH-CYST1NE FRACTION IN THE PISUM SEED ALBUMINS. HYBRIDIZATION TECHNIQUE VS. SUCCESS RATE. LOCATION OF _B AND St IN PISUM. REGENERATION OF GENE LINES OF Pisum sativum FROM CALLUS CULTURES. ANTHOCYANIN AND ALLELES AT THE D LOCUS IN PISUM. GENETIC RESISTANCE TO Heterodera goettingiana Lieb. IN PISUM. TEMPERATURE DEPENDENT BEHAVIOR OF A CHLOROPHYLL MUTANT OF PEAS. Some facts and thoughts about amyloplast enzyme compartmentation.